With warm weather around the corner, there’s no better time to spruce up your home than the spring. From reorganizing your closet to decluttering your garage, there’s a lot to be done to make sure your home sparks joy. With a few extra steps, you can easily add “protected against pests” to your list of accomplishments. Stink bugs: These can be particularly destructive pests. They can damage ornamental plants and gardens. As their name suggests, stink bugs also emit an odour that intensifies if they are crushed. They frequently die in light-fixtures, creating a foul smell in the room. Boxelder bugs: These bugs are typically found on box elder trees, but they will move inside to hibernate through winter. While they do not bite or spread disease, it can be startling to see them move en masse when spring arrives. In large numbers, the orange colouration of their bodies can stain surfaces. Asian multi-coloured lady beetles: Although beneficial in the garden, these beetles are a nuisance if they make their way inside. They secrete a foul-smelling liquid that can stain surfaces, and you may find piles of dead insects around lights and windows. Cluster flies: Once inside, cluster flies gather in protected areas like attics and wall voids to settle in for winter. When spring arrives, you could find swarms gathering around windows. Excrement from the flies can also stain curtains and walls. Vacuum thoroughly, including the attic, garage and areas with nooks and crannies. Replace worn door and window seals. Daily wear and tear create gaps that allow pests indoors. Replace torn window and door screens. Clean dirt, leaves and lint from the exhaust of dryer vents. Clear debris out of gutters to prevent water from pooling. Trim tree branches and shrubbery so that they are not touching your home. Pests will use the branches as a bridge to come inside. If you are replacing mulch, consider using cedar. In addition to helping repel pests, cedar lasts longer than other woods. Avoid planting fragrant flowers and vegetation that produces nuts, fruit or seeds. Opt instead for lavender, marigold, lemongrass, chrysanthemums and petunias. Remove clutter in the attic and garage. Clutter provides harbourage for pests, and cockroaches even feed on the glue that holds cardboard boxes together. Clean out your pantry. Get rid of old, unused products – especially those that have expired or gone stale – before restocking. Inspect spring and summer clothing as you remove them from storage. Be sure that your clothes were not infested over the winter with pests like cloth moths or other fabric-infesting insects. These to-dos should pair nicely the items you already have on your list. 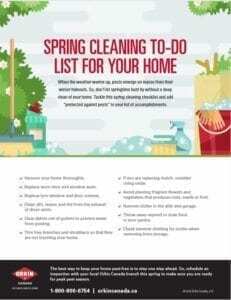 To make sure yourself stay on track, download our Spring Cleaning Checklist.